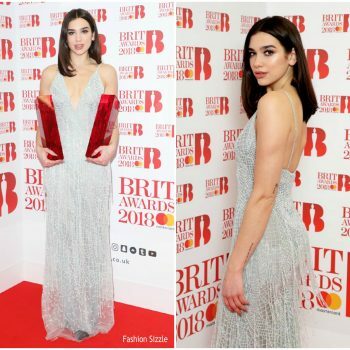 Dua Lipa attended the 2019 Global Awards on Thursday (March 7) in London. 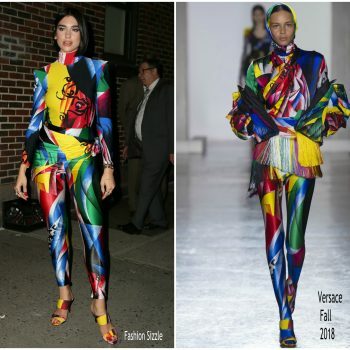 She wore an one-shoulder Marine Serre Fall 2019 print dress . 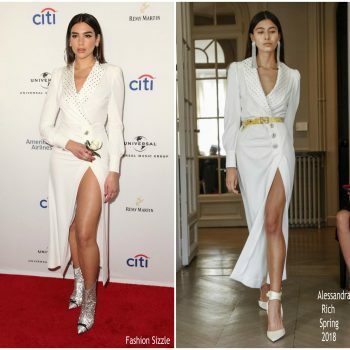 Dua Lipa attended the Warner Music Pre-Grammy Celebration She wore a black Alexander Wang Spring 2019 design styled eith Delfina Delettrez jewelry . 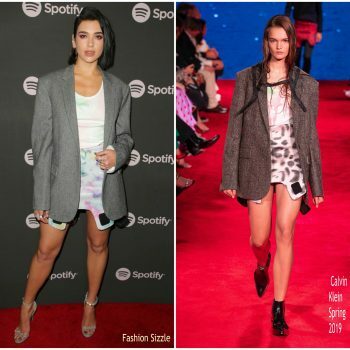 Dua Lipa attended Spotify ‘Best New Artist 2019’ Party She wore a Calvin Klein Spring 2019 design. 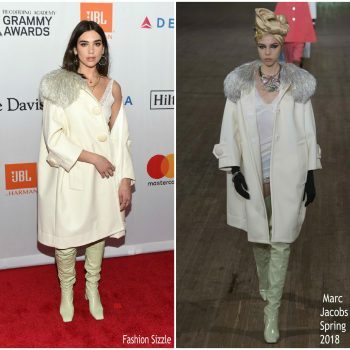 Dua Lipa attended the Pre- Grammys Press event She wore Marc Jacobs Spring 2019 design styled with a Paco Rabanne bag. 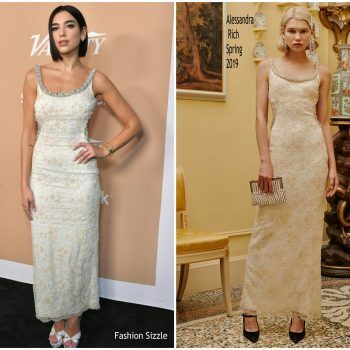 Dua Lipa attended The ‘Alita: Battle Angel’ Los Angeles premiere on Tuesday (February 5) She wore a gold sequin Prada gown. 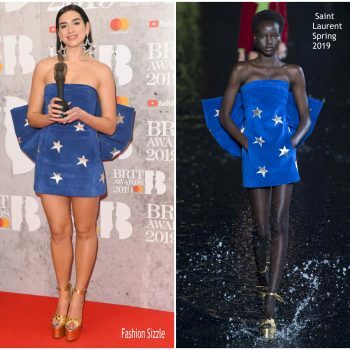 Dua Lipa attended and performed at 2018 Bambi Awards on Friday (November 16) in Berlin, Germany. The singer took home the ‘International Music’ award. 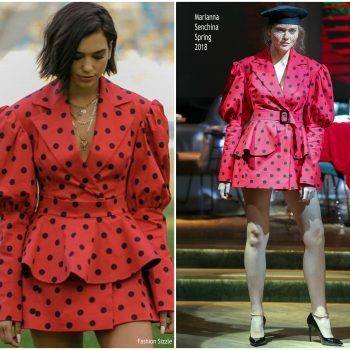 For her performance she wore a Christopher Kane Spring 2019 dress. 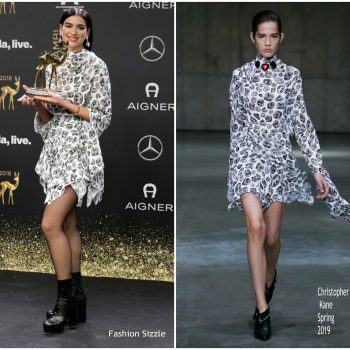 Dua Lipa 2018 Bambi Awards on Friday night (November 16) at Stage Theater in Berlin, Germany. 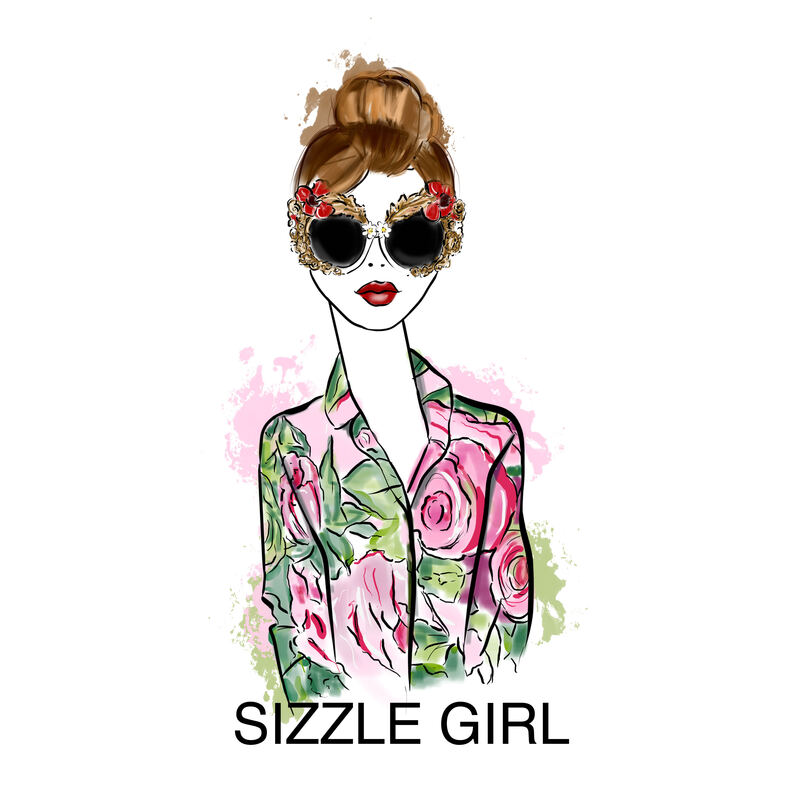 She wore a Valentino Spring 2019 gown . 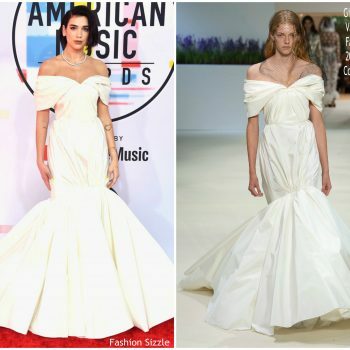 Dua Lipa attended the 2018 American Music Awards on Tuesday (October 9) at the Microsoft Theater in Los Angeles. 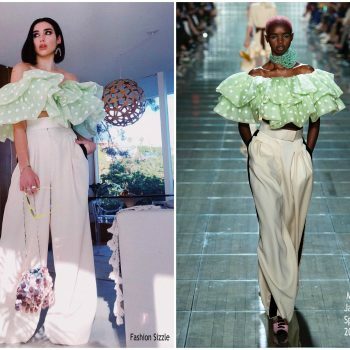 She wore a white Giambattista Valli Fall 2018 Couture gown. 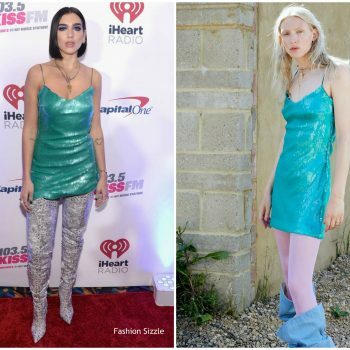 Dua Lipa wore a Saint Laurent leopard single-shoulder draped dress + accessories to the 2018 GQ Men of the Year Awards in London. 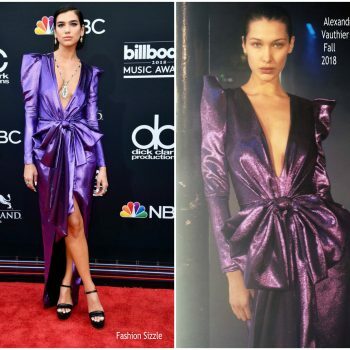 Dua Lipa walked the red carpet at the 2018 Billboard Music Awards held at the MGM Grand Garden Arena on Sunday (May 20) in Las Vegas. 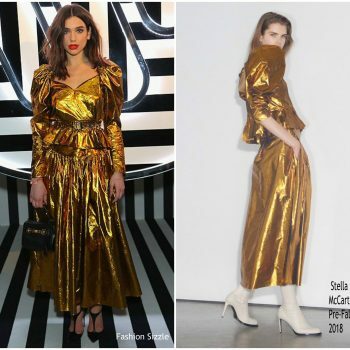 She wore a metallic purple Alexandre Vauthier Fall 2018 dress. 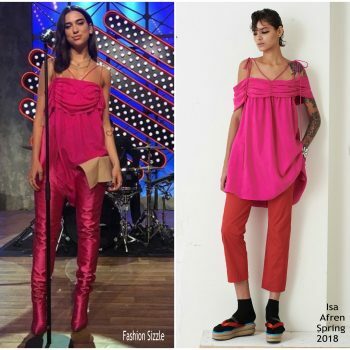 Dua Lipa performed IDGAF on Quotidien in Paris France She is wearing pink Isa Arfen Spring 2018 RTW Dress She styled her look with a Boulevard Necklace and Iman Necklace ($65.00) both by Shami, and Vetements + Manolo Blahnik Satin Boots ($2,112.50). Dua Lipa attends the Capital FM Jingle Bell Ball with Coca-Cola at The O2 Arena on December 9, 2017 in London, England. 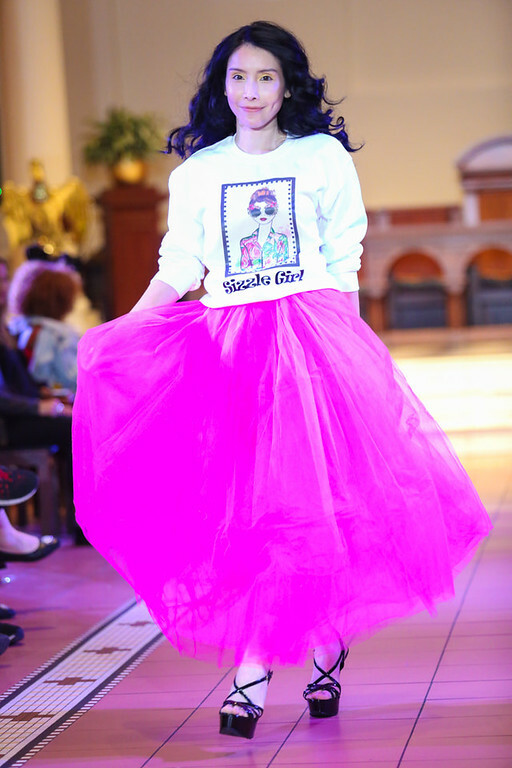 She wore Philosophy di Lorenzo Serafini top and trousers. Dua Lipa attended the world premiere of 'Dunkirk' at Odeon Leicester Square in London on(July 13th) . She wore a sheer black long sleeve Ulyana Sergeenko Couture silk-chiffon .